ZenMate by ZenGuard is a Chrome-based addon which provides you the ability to browse the web without censorship and to spoof which country you're browsing from. 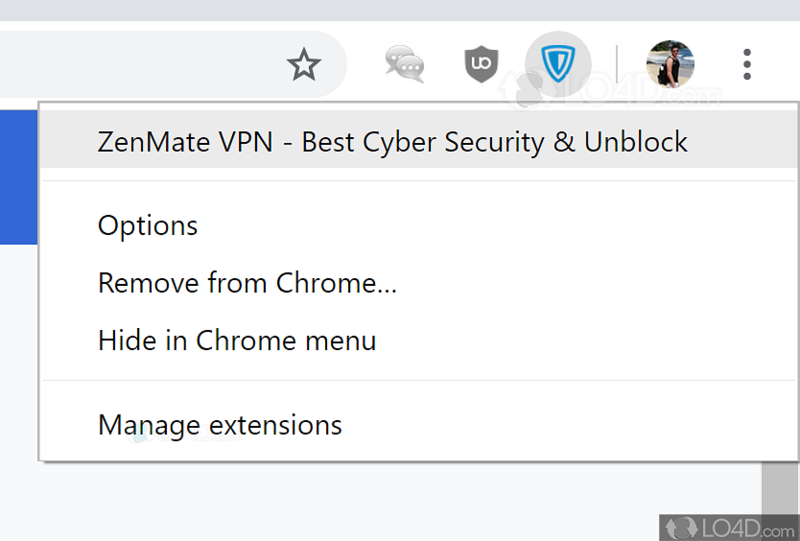 With this nifty Google Chrome addon, you can encrypt your Internet connection so that whatever you're viewing in not known to anybody who may be snooping on your connection, including government agencies like the NSA. ZenMate also makes it possible to view content which is normally restricted to your current geographical location. This may include restricted news publications, videos and anything else a government does not want its citizens reading. While you're using this program, you're able to easily switch between geographical locations although your connection speed may be diminished. With the default setup, your connection will automatically route through Switzerland but the option to use US, UK or German proxies is also present and available for free. Though the option to "geo-switch" between many other countries isn't possible at the moment, the possibility exists that ZenGuard will increase the amount of countries supported. As with most Chrome addons, installing ZenMate is very easy and does not require a restart. ZenMate is easy to use, install and more importantly, provides you with much more security if you're in one of the many countries (in the West and elsewhere) which spies on its citizens. ZenMate can hide your true IP address and circumvent state censorship. ZenMate is licensed as freeware for the Windows (32-bit and 64-bit) operating system / platform from anonymous proxy software without restrictions. ZenMate 6.1.3 is available to all software users as a free download (Freeware). Compatibility with this software may vary, but will generally run fine under Microsoft Windows 10, 8, 8.1, 7, Vista and XP on either a 32-bit or 64-bit setup. A separate x64 version of ZenMate may be available from ZenGuard. This download is distributed as fdcgdnkidjaadafnichfpabhfomcebme. We have tested ZenMate 6.1.3 against malware with several different programs. We certify that this program is clean of viruses, malware and trojans. 4.2 out of 5 based on 106 ratings.